The soaring, free spirit of jazz was born and raised in the U.S. It endures and will always be a cultural highlight of the U.S., because it is a rare art form that reflects the unique spirit of the specific artist performing at that precise time. More than anything, jazz celebrates individualism. This Labor Day Weekend, Detroit will host its 35th Annual Detroit Jazz Festival, and it will celebrate jazz, jazz artists, and Detroit. 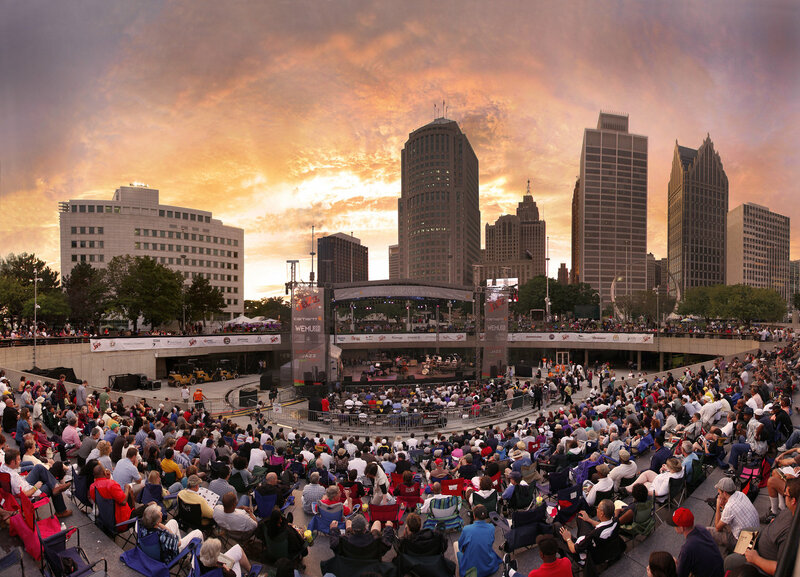 The Jazz Festival invigorates downtown from Hart Plaza to Campus Martius. The Festival features jazz greats from throughout the U.S., like Pharoah Sanders, Randy Weston, and Esperanza Spalding, and homegrown artists, like Barry Harris and MacArthur Fellow Regina Carter, and the list goes on and on and on — five stages and 100 acts. This is the world’s largest, free jazz festival. Like so many great art forms, jazz is important to Detroit. The Detroit Jazz Festival COO, Cornell Batie, notes that, “Jazz is an iconic music genre in Detroit and something the city has deep roots in.” He went on to remind me that while the Festival is four days, the work that the Detroit Jazz Festival does is year-round. The Detroit Jazz Festival team provides year-round educational workshops and performance opportunities, and they work with six Detroit schools to provide weekly instructions. I asked him whether someone who does not have a jazz background should feel comfortable coming to the Festival. He quickly answered “Absolutely.” He explained that, “there are hundreds of people that come to this festival that don’t have a strong knowledge or connection to the genre, but come to see what all the fuss is about. I’d like to think we’ve turned thousands of people onto the jazz beat over the years. And don’t forget, this festival is about more than jazz, it’s about celebrating the arts and culture that Detroit has to offer and we’re thrilled to be a part of that.” That’s a good point. If you like art, if you like to be entertained, if you like a party, you should come and at least see what all the fuss is about.Subscribe to The Morning Email.Wake up to the day’s most important news. One act I am particularly looking forward is Steve March-Tormé’s tribute to his father, Mel Tormé. This is Steve’s first appearance at the Detroit Jazz Festival, and his set is at 4:30 p.m. on Labor Day. I asked Steve a few questions to learn more about his background and to introduce him to you. Colin: How/when did you get started? Steve: I got started in the music business when I was 13 years old with my first “rock” band. I wanted to be a major league baseball player and after I listened to Yankee games in our basement in Westchester Co., N.Y., I started listening to the hits of the day on AM radio (Frankie Valli, the Orlons, Curtis Mayfield and the Impressions, all of the Beatles music, Beach Boys, etc.) and that was when I first started singing along with the them and thinking “if I don’t make the majors, this is what I want to do.” Well, I gave up the baseball idea after the age of 15 but continued playing fast-pitch softball into my forties, making two national teams that played over in Israel in the Maccabiah Games, winning two gold medals for the U.S. But obviously I’m glad I chose music. Steve: I get inspired by hearing great musicians and hearing their precision and dedication to their craft. That literally inspires me. The musicians I listened to and admired (and still do) include Joni Mitchell, James Taylor, Steely Dan and Take 6 to name a few. Colin: What do you want someone to say after listening to one of your shows? I practice so much to be musically precise but my greatest gratification comes from moving people emotionally. I didn’t plan on that; it has just evolved as hopefully I have. Colin: What does it mean to you on a personal level to be able to pay tribute to your dad? Colin: After the DJF, what’s next? Steve: After the DJF, come back to Michigan to do my own concert at the Bermen Center in West Bloomfield Township. Then I come back to Wisconsin where I’ll host and perform in a show here called “Doctors in Recital”, a fundraiser featuring physicians who have surprisingly adept musical talent. 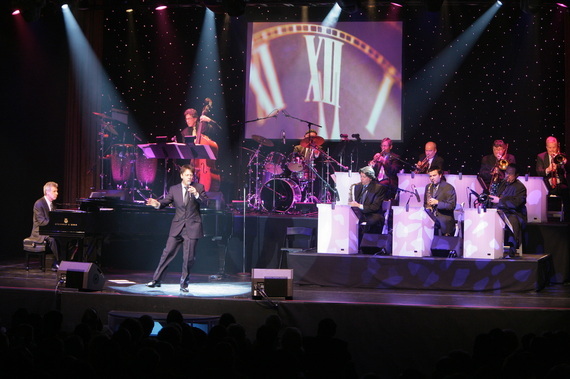 After that, I’ve been asked to perform in a show in Las Vegas called “Next Generation”, featuring myself, Lorna Luft (Judy Garland’s daughter), Dean Martin’s youngest son Ricci and Louis Prima’s daughter Lena. Do we detect a theme? This weekend, let’s celebrate jazz and Detroit and the beautiful artistic individualism that jazz highlights.